Was Copa America a success for the U.S. team? Outside the Box: "The U.S are a competitive team that can hold its own against decent sides, nothing more, nothing less." So the United States ended the Copa America Centenario in fourth place, after losing 1-0 to Colombia in the third-place game in Arizona on Saturday and the question begged is – was this tournament a success for Jurgen Klinsmann’s team? The first thing to say is that the third-placed game counts in the evaluation. To their credit both Klinsmann and his Colombian counterpart Jose Pekerman picked full strength teams for the game and their players competed to win. 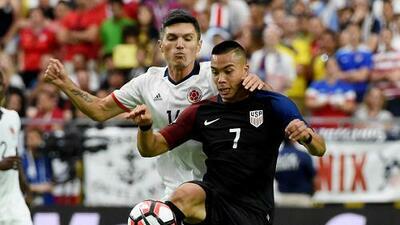 Although the U.S. created some chances and battled well, the outcome was hardly an unfair one. That was the second defeat to Colombia in the tournament for the U.S. and it was a better performance than in the opening 2-0 loss in Santa Clara. Fourth place means the U.S. did better than Brazil, Mexico and Uruguay – all teams that on paper are superior to Klinsmann’s squad. In that sense, the tournament has clearly been a success. The two teams that meet in Sunday’s final in New Jersey, Argentina and Chile are clearly better than the U.S. and the 4-0 loss to Argentina, was no disgrace, in results terms at least. But looked at overall, Klinsmann’s team beat opponents that they could, on a good day, be expected to beat – Costa Rica, Paraguay and Ecuador, but they were comfortably dealt with by better teams – the Argentines and Colombia. What does that tell us? Nothing really that we didn’t know. The U.S are a competitive team that can hold its own against decent sides, nothing more, nothing less. Watching the Euros, how many teams would the U.S be expected to struggle against in a World Cup meeting? Only really the favorites, say France or Germany, would be presumed to confidently beat the U.S. Remember, when the Americans drew with England in South Africa in the 2010 World Cup, it wasn’t treated any longer as a surprise. Would the Americans be beaten by a Wales or Hungary? Possibly, but they certainly wouldn’t start as underdogs and would fancy their chances. But the American soccer community struggles to judge performances by normal criteria or levels of expectation. Because the sport is a not a leading one on a national level, because the country was late to begin giving soccer serious attention, progress is always judged as part of the grand narrative of the project to ‘grow the game’. Sometimes this takes the form of discussions over whether soccer is more important than hockey and there is much obsessing over attendances and television ratings. In technical terms this takes the form of the questions about how far the U.S from the ‘elite’ in the game? I addressed some elements of that debate in my Washington Post column this week and I do believe the U.S would be more competitive if its best players were playing in intensely competitive leagues on a weekly basis. They would become stronger, sharper, tougher and, to use Klinsmann’s phrase ‘nastier’. But when you take a step back from the ‘grand narrative’, the U.S. men’s national team aren’t doing that badly really. No great leap forward, no stunning jump to the oft-cited ‘next level’ but steady progress. There are of course some who think the progress would be much better if the coach were to be replaced by a better one. This is the case with most teams who aren’t winning trophies. It is true that at times Klinsmann doesn’t get the tactics right (the opening game v Colombia being one case) and of course there are always arguments over team selection. It is also clear that the relationship between Klinsmann and U.S Soccer president Sunil Gulati isn’t a great one, as illustrated by Gulati’s media statements before the crucial second group game against Costa Rica where he made it clear that Klinsmann’s job was on the line. And it pretty rare for a national team coach to stay in charge for two full World Cup cycles, a length which carries the danger of a coach’s voice and message losing its impact with the players. But the relationship would have to be at a state of total disrepair for Gulati to fire Klinsmann after a fourth placed finish in this tournament and while there has been speculation linking the German with potential opportunities in England, there is no indication he is ready to move on yet. So what future for the U.S. team? Well the best hope for an improvement ahead of Russia 2018 would be for Christian Pulisic and some of the other younger talent already in Europe and MLS to really breakthrough and add some extra quality to what is a solid, workmanlike team. Expect a slightly younger, possibly slightly better version of this team in Russia. Qualification comes first though and while it should be straightforward, the ‘hexagonal’ stage is always produces some challenges. Road trips to Panama, Costa Rica and Mexico are always tough – and no-one will really enjoy trying to win games in places like Jamaica, Honduras or Guatemala either. It is a case of just doing the job. But in between those obligatory tasks, Klinsmann needs to find some space with friendlies to try out some of the younger talent, give them a chance to grow into his side and perhaps discover some of the creativity and sparkle that is missing from his team at the moment.